Consider a scenario where you need to push files to several computers on the Internet from a master location. Let's call this master location the template machine and receiving computers the target machines. This page provides step-by-step instructions on how to accomplish this goal by synchronizing files from template machine to target machines. The following assumptions are made in this article. The template machine will always push files while target machines will always pull them. Although you can install the Syncrify server on the template machine, a cleaner approach is to install it on a different machine - other than the template or any target machines. Let's call this the broker machine. 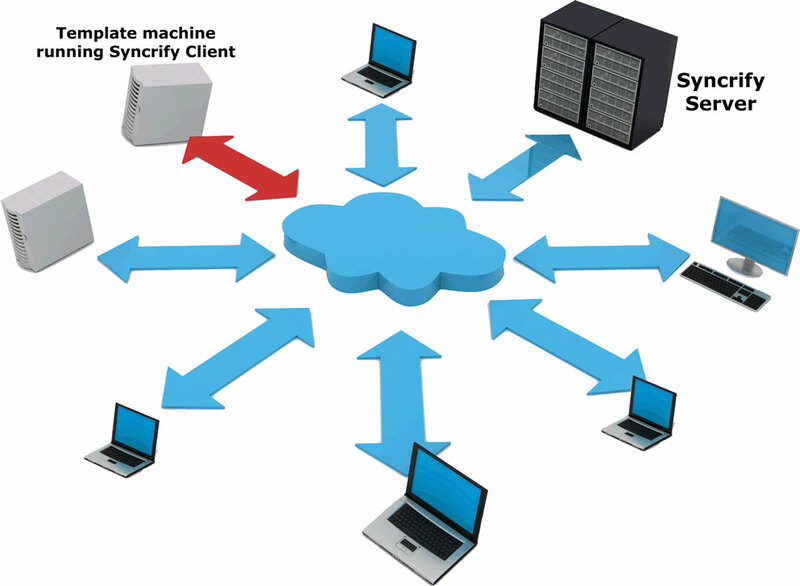 Install the Syncrify server and configure the broker machine. You may have to configure the firewall at the OS level as well as the router that is provided by your ISP. In this example, we are using the default HTTPS port, which is 443. Try accessing the web interface using https://localhost as the URL from a browser. Then, create one user account in your Syncrify. Let's say the email address of this user is userOne@xyz.com. Once you see the web interface from the template machine, download Syncrify client using the link that appears on the right hand side. By default, the Syncrify client creates a profile matching the machine's host name. Specify the Remote Server URL in this default profile to https://broker.xyz.com. There is no need to specify any other value in this profile. Click the Advanced tab and set the Direction field to Client to Server. This ensures files are copied from the template machine to the broker machine. Now you are ready to run a backup. 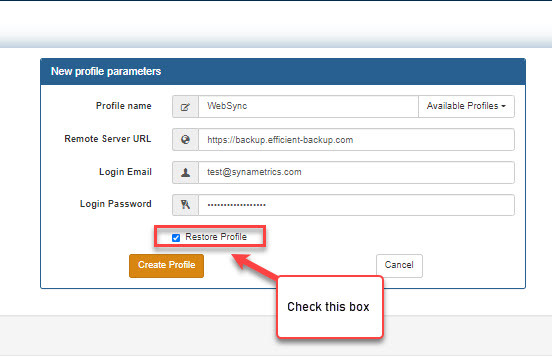 Simply click the Backup button in Syncrify client. This will copy files from the template machine to the broker machine. Once the backup is complete, use the browser to connect to https://broker.xyz.com and connect as the userOne@xyz.com. You should be able to browse through the files you just backed up. Click Create Profile button to create a new profile. Specify Remote Server URL, Login Email and Login Password. Then click the Fetch profile button next to the Profile name field and select WebSync for the Profile name. Click the Restore Profile button. Click here for a screen shot. Very Important: Once the profile is created, click the Advanced tab and change the direction field to Server-to-client. This ensures files are pulled from the broker machine to the target machine. Repeat these steps for every target machine you have. Optionally, you can make the WebSync profile in this example a read-only profile with an exception rule for the template machine. This way none of the target machines will be able to run a backup using Client-to-Server for direction, preventing potential data corruption on the broker machine.